Introduction: Parathyroid hormone (pth) maintains calcium homeostasis in hypovitaminosis D and has deleterious effects on bone metabolism. Vitamin D (Vit D) is low in pts without adequate sunlight exposure or oral intake. 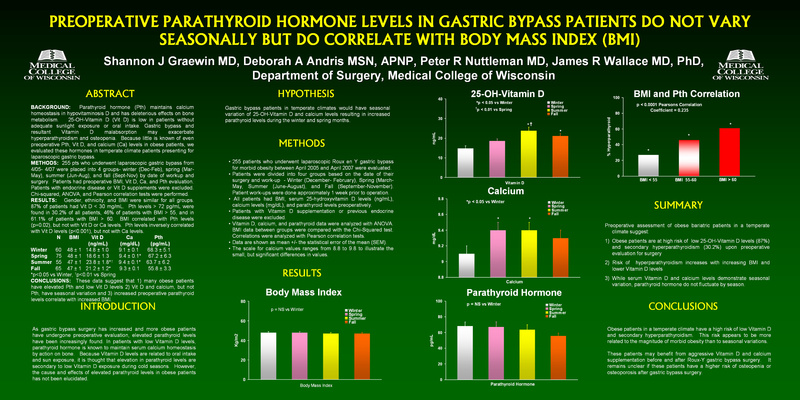 Gastric bypass and resultant Vit D malabsorption may exacerbate hyperparathyroidism and osteopenia. Because little is known of preoperative pth, vit D, and calcium (Ca) levels in obese pts or how they vary by season, we evaluated these hormones in temperate climate patients presenting for laparoscopic gastric bypass. Methods: 255 pts who had laparoscopic gastric bypass from 4/05-4/07 were placed into 4 groups-winter (Dec-Feb; n=60), spring (Mar-May; n=75), summer (Jun-Aug; n=55), and fall (Sept-Nov; n=65) by date of workup and surgery. Pts had preoperative BMI, Vit D, Ca, and pth evaluation. Pts with endocrine disease or vit D supplements were excluded. Chi-squared, ANOVA, and Pearson correlation tests were performed.